I’m so excited summer is finally here! With summer comes more opportunities to entertain and more time outdoors enjoying good food and beverages. Having a good pasta salad under your belt is imperative for both entertaining and being a good summer guest who brings a dish. 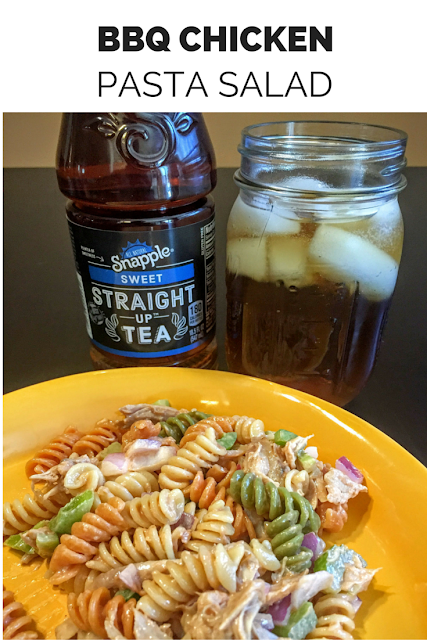 If you’re looking to step your game up from the average pasta salad I have a great recipe for you: BBQ Chicken Pasta Salad. Shred your rotisserie chicken and set aside. To shred simple take your chicken off the bone and use two forks to separate the meat until you have nicely shredded pieces. You could also make your own chicken breasts and shred them, but for summer entertaining I like to take any opportunity to cut time and keep the oven off. Mix together the barbecue sauce, mayonnaise, and apple cider vinegar in a small bowl to make your dressing. Chop your veggies. For the red onion, after dicing, place the onion in a bowl of cold water until you are ready to add it to the salad. Soaking the red onion helps to take away some of the bite that raw red onion has and give it a milder flavor. You can use any type of pasta for this recipe but I love to use tri-color rotini because the color makes for a nice visual appeal, and the sauce gets sucked up in the little corkscrews. Cook the pasta in salted, boiling water according to the package directions. Drain the pasta and immediately toss with about 1/4 cup of the dressing to keep the pasta from sticking and to make sure it gets coated with flavor. In a large bowl, combine the cooked pasta, chicken, drained red onions, pepper, and celery. Toss with the remaining dressing until evenly coated. Taste the salad and add salt, pepper, more mayonnaise, more barbecue sauce, or more apple cider vinegar to suit your taste. Serve immediately. This is best at room temperature, but you should refrigerate leftovers. I cannot tell you how refreshing this salad is with a nice cold glass of iced tea. It really puts you in a summer afternoon mood. I’m currently loving Snapple® Straight Up™ Tea. Made with all-natural ingredients. Snapple® Straight Up™ Tea tastes like fresh brewed iced tea. You can keep everyone happy even if you are working with different tastes as they have three levels of sweetness, plus black, green and rooibos tea varieties. On my last trip to Giant I picked up the Sweet, Sorta Sweet and Rooibos varieties. I love pasta salad. This is a great variation on the basic recipe.